It took over a year, 13 ½ months actually, from biopsy to final treatment. In that time, I had 55 doctor appointments and 127 procedures. 127! My last treatment this past November 7th, to me, was when I became a survivor. When I think about what contributed to my survivorship, I think of 3 basic things: my medical treatment, the support I received, and my focus. My medical team saved my life, no doubt. Most treated me with compassion and their expertise. I thank them all. The support from Lynn and the kids, family, and friends saved my sanity. Joining the support group gave me insight, advice and support that was invaluable. My focus of the PCT and hiking gave me strength. I don’t know how to describe having this year of cancer behind me, but it feels liberating. I am starting to feel like myself again. It is time to move on. It’s interesting how sometimes, as a cancer patient I could feel like I wasn’t “doing it right.” Some people found God, or strengthened their beliefs. That was what I thought I was supposed to do. I even read one woman’s comment on Whatnext.com, that she was upset she didn’t find more comfort in her religion during this. I lost the spiritual. I was not one of those that found myself closer to God over this. To me, I decided if it were important, then it would come back. What I have done, with limited success, is become more mindful of whom I am with and what I am doing. I try to maintain the bonds and friendship with those who cared. This is something I will continue to strive for, mindfulness. On my celebration hike, the sun was shining. My iPod was playing some great Led Zeppelin. Lynn was ahead of me a quite a few feet. I was thinking about all I went through and just being in the moment with the beauty around me. I just had to sing. Believe me, it’s not something you want to hear, me sing that is, but there I was, singing loudly. I felt truly happy. I realized how long it had been since I felt so much happiness. It became apparent how healing this trail had been for me, what it gave to me. Some day I will give back. 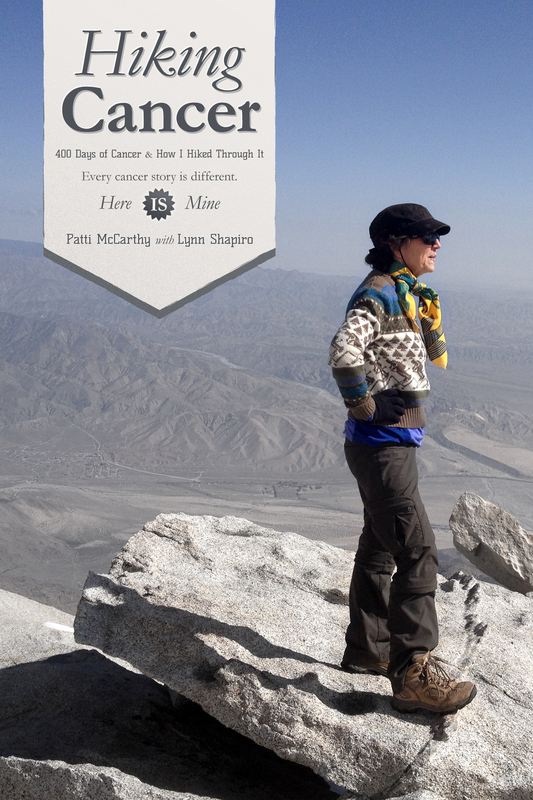 If we hadn’t started hiking five months before I was diagnosed with breast cancer, I know we would not have started during treatment. This trail let me live my life, not cancer. It was a solace of getting away and refocusing on what is important. The PCT gave me strength. For that I am forever grateful. In my quest to be back to my old self, I was going to throw away everything in my house that said cancer; my appointment reminders, my cards, scarves, anything with pink ribbons. I was not a scarf wearer before and I wasn’t going to be now. I would stop going to the support group. I would stop going to the yoga cancer recovery class. It would be a closed door in my life, except for all the follow-ups every three months for two years then blah blah blah for eight more years. I wasn’t going to wear the banner. As I was getting ready to toss my hats and scarves, I started looking at some of the scarves. I thought, “You know, these are really pretty.” I had an epiphany. Having cancer sucked, no doubt, but I can’t erase what I’ve been through. It’s part of who I am now. I don’t have to like it but I can accept it. I have most of the old me back, but with changes, physical and emotional. Those changes are irrevocable. I felt ready to wear the banner. In fact, I now EMBRACE the changes and my cancer. I learned from it. I put on my shirt with the breast cancer logo, and a scarf around my neck or head. I am keeping the scarves. I’m so happy just to have hair! I like my curls. I continue to go to support group. I am still hiking on. I am not a bitter person, but I am a better person. So, these conclusions come to mind as Lynn and I launch our book, “Hiking Cancer.” The book is a combination of a few of our blog posts, my essay and journal entries and resources for both cancer patients and for section hikers. It is done and is available currently at Amazon.com in e-book format. And later next month, we will have 150 first, trade editions available directly from us. These first editions I will gladly sign for anyone who is interested.